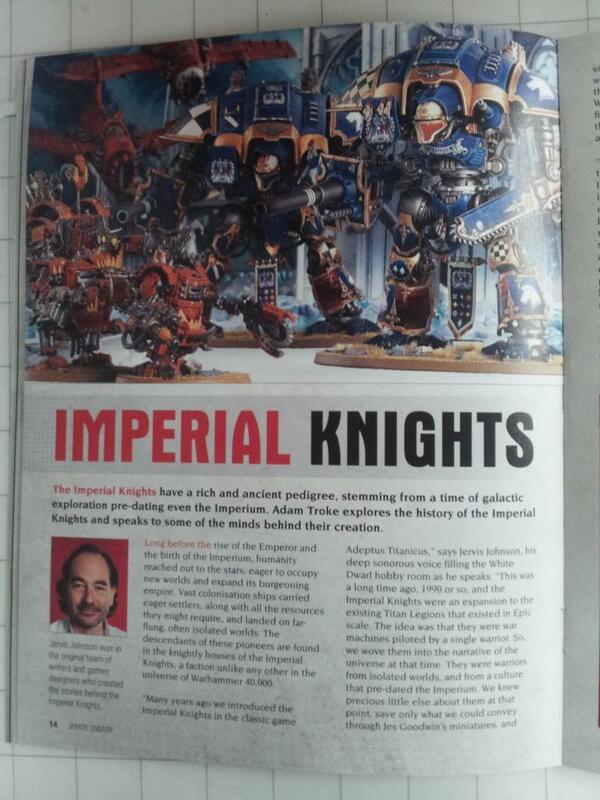 ... March will see the release of Imperial Knights. This year is shaping up to be a good one. There is vague chatter of other weapons options. 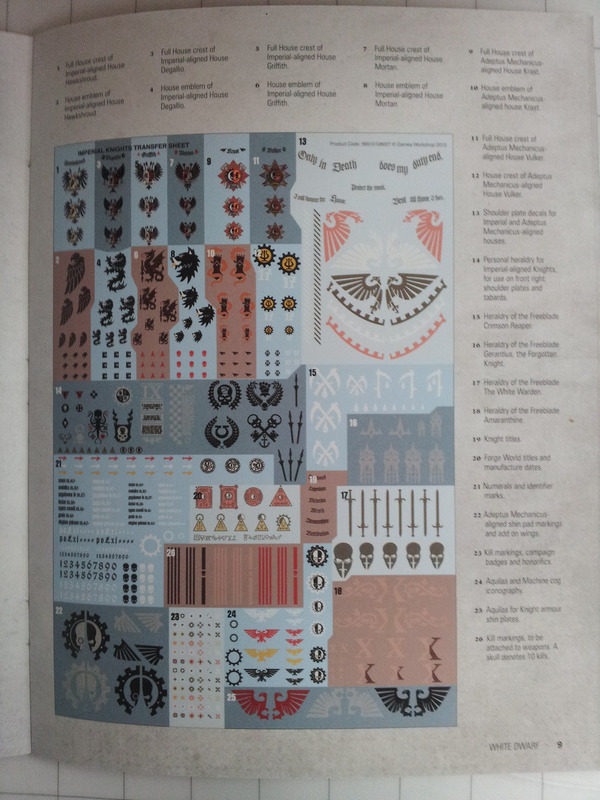 Some clarification on the rules we presented in White Dwarf today for some folks here: the Imperial Knights don't occupy any force organisation slots, they are not Lords of War, they are an army unto themselves. Something we forgot to say is that all Imperial Knights are scoring units, and if you're playing 3-6 as a primary detachment, pick one as your Warlord. Knights can be fielded in two different ways: as a detachment for a regular Warhammer 40,000 army, including between one and three Knights, or as a full Knight army of up to six of them. Yes, that’s right, you can field a whole army of these massive war machines. I got the new White Dwarf yesterday (I love my FLGS) Knights of the Imperium is a novella. 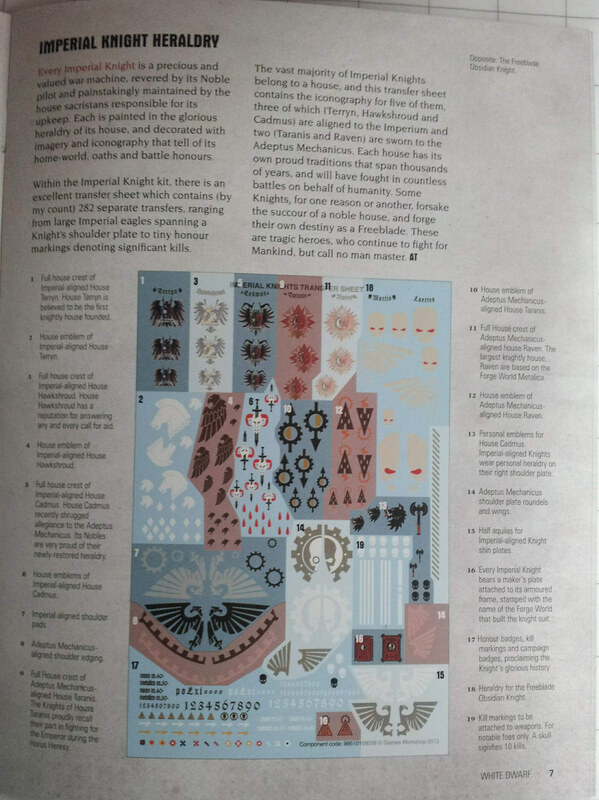 The companion guide is extended fluff and heraldry, etc. Imperial Knights ONLY. No other Ad Mech, or Freeblade units. Ok guys, before the inquisitors come for me, I have some Intel from my spies in GW. 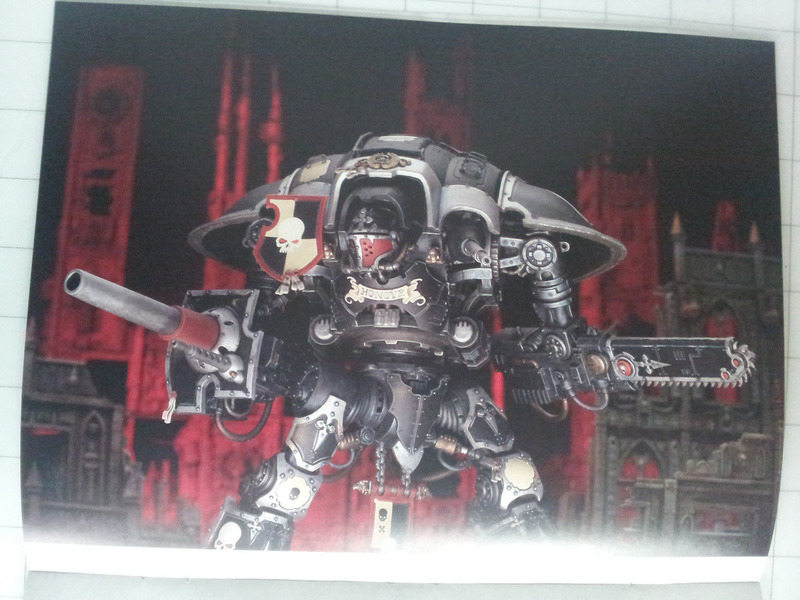 I have gotten a report of new knight titan variants from Forgeworld. The 3 alternative knight variants mentioned in Codex:Imperial Knights are being produced as FW kits, with rules to be released in a new IA. The crusader and Castellan will have the same mask, one with a targeter/bionic eye looking bit, a scope/range finder that attaches to the carapace, and alternative weapon arms that are both ranged weapons(which is nice, as my titan seems to get spanked when I try to run in and use my chainblade). My buddy wasn't sure which guns belonged to whom, but one looked like a laser lance of some sort, and was told it would be along the lines of a long range strength10 ap 1 las cannon, possibly with 2 shots, but DEFINITELY not D. There is also a gatling weapon, not sure if its projectile or las, but they look cool, and the Lancer has smaller armor plates on the legs, and a different head. Also, to reflect the rare nature of the variants, the pilots are senechals with ws bs5, and a 3+ invul to reflect their prowess (super important since the lancer apparently has less armor, but is faster (fleet from what I'm told). Take this rumor with as much salt as your like, and this is second hand for me too, but this guy usually isn't full of crap. Also, it seems that FW is doing some commo and banner stuff for the hole in the top of the carapace. I'm super jazzed about these, since as a former epic player, I was disappointed to see so few of the knight variants represented. 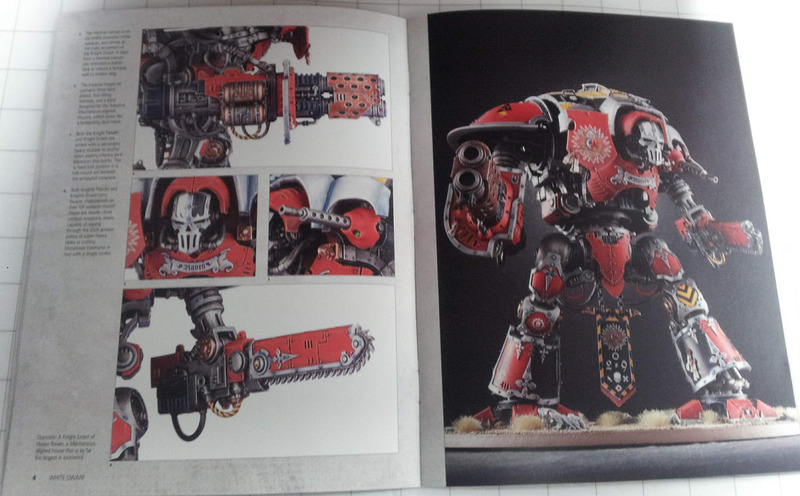 Sources say Forgeworld is has been taken aback by the massive positive response to the Knight Lancer, shown off at Forgeworld Open day and featured in Horus Heresy 3: Extermination. Last edited by Bigred; 04-08-2014 at 11:03 PM. Any idea whose codex they're being attached to? IG? All Imperial? I'm hoping for the latter, both selfishly (not really into IG, myself) and because it's a better fit, in my mind, for what the Collegia Titanica is supposed to represent in the backstory. So overpriced, low initiative walkers that will die in a round or two of shooting with weapons that you can have on tanks. The Knight Paladin could be cool as a long range nuke machine, but at almost 400 points that does not seem worth it. At all. I'm really hoping these rumors are no where near the mark. It's a superheavy, dude. You basically can't one-shot them, and they're going to have a ton of hull points. I am the Hammer. I am the right hand of my Emperor. I am the tip of His spear, I am the gauntlet about His fist. I am the woes of daemonkind. I am the Hammer. Seriously... a giant superheavy awesomestrocity that can provide fire support to soften you up before my my assault marines crash into your lines? What's not to love? Shall wait and see for accuracy, but I'm liking so far. Can you one-shot them? No. But you can two-shot them. Seriously, a 125 point Tactical Squad with a Drop Pod, a Meltagun, and a Combi-Melta has pretty solid odds of blowing it straight to hell Turn 1. Drop in, score two Penetrating Hits needing only below average scores, roll 4+ for the Vehicle Damage Table, then inflict the average number of secondary explosions, and you'll inflict the 6 Hull Points necessary to kill it. That's 48 points of Marines killing off a 375 war machine in a single turn. LCS is absolutely right. It's not at all worth it, and I really hope the rumors are off. Sadly, though, the fun rumors are usually the ones that are wildly off the mark while the crappy rumors are usually the ones which are dead on center. Into their point cost I think (guess) we will also see some special rules that might give some or a few more benefits, making them a bit more worth their points. A super heave walker, can afterall, stomp pretty hard as well. Well with Land Raiders clocking in at 250pts plus, and this thing being somewhat larger, pricing in the 300s seem reasonable. So the issue will be the stats. It almost has to be a superheavy to warrant the pointcost, but either it should need much higher lethality, or a ton of hullpoints. There is talk of 6HPs out there, but that seems low.